You have a database. You value your database. You may even obsess over your database. The problem is, for maximum growth you want to expand your reach. You want to continually reach new, additional qualified businesses beyond the contacts in your database. What’s one of the fastest and most effective means of doing this? Strategic partnerships. A Frost & Sullivan survey found that more CEOs pointed to strategic partnerships as their number one growth strategy than any other strategy. Strategic partnerships can deliver access to new markets, customers, and audiences, and can improve a company’s competitive positioning. They help your business achieve far greater reach than you could do on your own. In certain cases, they save you money as you collaborate and share costs with others in your co-marketing initiatives. As a result, strategic partnerships can often be a highly cost-effective means of lead generation and customer acquisition. The Frost & Sullivan survey revealed that many companies commit more than 20% of their assets to developing and managing partnerships. On the high side, others depend on partnerships for 30% to 50% of their annual revenue. And partnerships can help your business even if not directly associated with leads and revenue. For example, here at Stratabeat we have a few partners to whom we often refer business, as we simply do not provide the same services or the prospective client would not be the right fit for us based on our ideal audience segments. Our attitude is that it’s always best to do what’s best for the client. If that means sending them to a specialist for a complementary service, then that’s exactly what we do. Strategic partnerships represent a potential path to accelerated growth, but without the same level of risk associated with going it alone. If you have yet to tap into the power of strategic partnerships, it’s worth an exploration to see whether it should be a new addition to your marketing strategies. How will the partnership contribute to your growth? Will the partnership produce a high ROI? Do they offer a capability that your audience needs? Is it a capability that your company doesn’t have, will not have in the near future, and is not interested in building internally? How big is their database and email reach? How big is their social following? What volume of traffic do they get to their website? Do they have the bandwidth to devote time and attention to making the partnership a success? Are they good at marketing and promotion? What other types of partnerships have they entered in the past, and what were the results? Learnings? If you do not pursue a strategic partnership, what growth opportunities are you leaving on the table? Eager to take your B2B marketing strategy to the next level? Give us a shout! 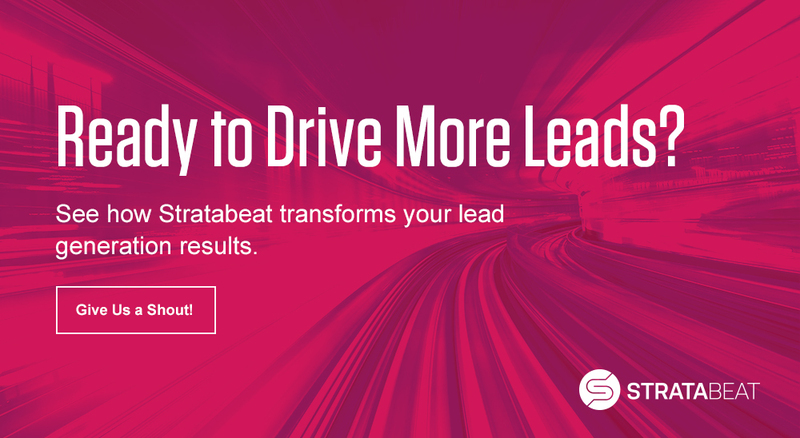 At Stratabeat we’ve partnered with strategic technology and platform partners in doing joint whitepapers and webinars. With certain complementary partners, we each act as a funnel for qualified leads for the other. For others, we’ve spoken at their marketing events, and they at ours. As with any relationship, how much you contribute and give it some TLC matters. Shower them with love and attention, and you’ll have a happy marriage. Ignore your partner, and don’t expect much in the way of results, and don’t expect the relationship to last very long. For this reason, we like to view partnerships over the long term and to discuss and agree on longer term plans with partners. If we are going to do a joint webinar or event, we prefer having several months for proper planning. Running around at the last minute is bad enough if you are going it alone. Trying to do that with a partner just causes more chaos. Set up times in your calendar for ongoing communications with your partners. For a more formal partnership, or one involving high costs, get it in writing. Sign an agreement and outline specific expectations. This is very important. LISTEN to your partner. What are they focused on? What are their new annual goals? What are their new priorities? What are their new capabilities? Where are they going longer-term, and how can you help them get there. Continually seek ways to add value to the partnership. When you commit to an action or task as part of the partnership, overdeliver. Don’t treat it lightly merely because it’s a partner instead of a direct client. Monitor the performance of your partner. If they are doing an awesome job, let them know how much you appreciate it. If they are showing a lack of effort, make it clear what needs to change for the partnership to continue. Celebrate. Be sure to keep score and celebrate the wins with your partners. Positive marketing results help to light a fire of passion among team members, leading to even stronger future results.